This is another game I did with Matt Talbert. Again, he made all the graphics and I put the game together. This is the same as the popular board game. How to play: You can use either the navigation buttons/joystick on your cell phone or the number keys 2,8,4,6,5 to navigate the yellow cursor and select squares. To rotate a boat, press the * key. If you don't know how to play Battleship, here are the basic rules. You place 5 boats on your board. You can place them horizontal or vertical. Then you and the computer opponent take turns trying to hit each others boats. You can't see where the computer put its boats and the computer can't see where yours are. So you select a sqaure where you think a boat could be. If you hit the boat, you'll see a fireball in the square the boat was sitting otherwise you will see a white "peg". If you hit every square the boat is in, the boat will sink. At this point, the boat will appear so you can see it and the fireballs will be replace with red "pegs". 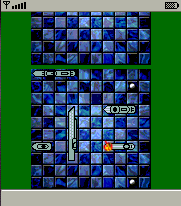 The object of the game is to sink all of your opponents boats before they sink yours. To exit the game, you may have to hold down the back button on your phone.